Witness outstanding musicianship. While his technical prowess is nothing short of incredible, his soulful phrasing truly conveys his artistic message to audiences across the world. Learn from a legend. Wycliffe Gordon is one of the nation’s foremost music educators having held positions at Juilliard School of Music, Michigan State University, Manhattan School of Music in the Jazz Arts Program. He is currently Artist in Residence at Georgia Regents University in Augusta, GA. Hear the history. 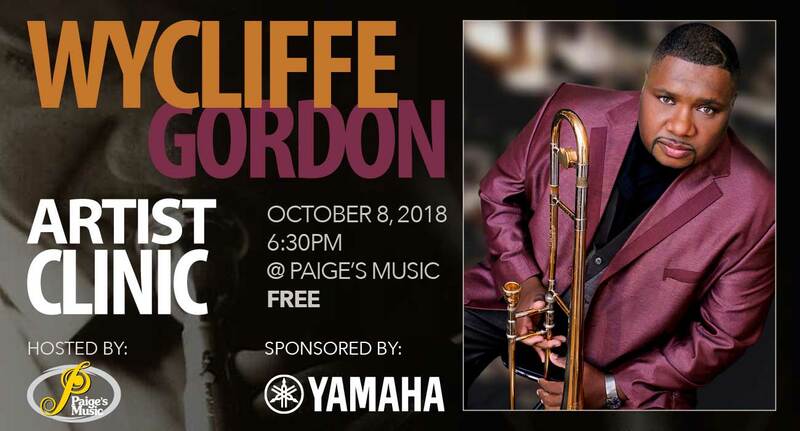 Wycliffe Gordon’s personal experiences over decades in the music industry coupled with encyclopedic knowledge of music history establish him as one of the foremost experts in the business. He does it all. In addition to being one of the finest trombonists in the world, Wycliffe Gordon is also an outstanding trumpeter, tubist, and singer. It’s free! Thanks to Paige’s Music and Yamaha we are able to offer this event at no charge. Ready to go? You can RSVP on our Eventbrite page!